What purely began as a love for creating has now gained worldwide following, even at major distinguished fashion weeks. Founded in 2014, ADER ERROR has made it their focus to work towards changing the landscape of modern art and fashion. Their motto – But Near Missed Things is all about reframing and remixing the mundane to create something unexpected and beautiful. Inspired by stories of reinvention, FUTRO encompasses innovative design that’s inspired by the past but distinctly future looking. 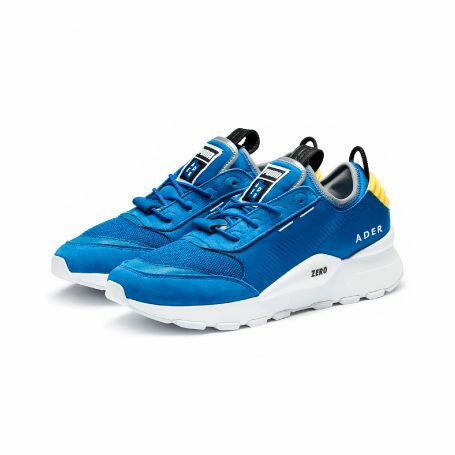 Continuing this legacy, the RS-0 ADER ERROR is built on PUMA’s comfortable Running System cushioning technology with a bold chunky sole, mixed material upper of leather, nubuck and mesh with form-fitting slip-on sock construction. The all-time favorite chunky court silhouette, PLATFORM TRACE ADER ERROR is also detailed with playful screen-printed text highlights and numbers, rear oversized patch in the shape of the letter ‘A’ for ADER and a unique double tongue with co-branded woven label. Completing the collection is a wide range of apparel picks in retro fabric and color combinations. The unisex PUMA x ADER jacket is styled with a removeable hood and woven label on the sleeve strap. Pants with dynamic cutlines, color blocked crew sweats, tees and accessories complete the capsule collection. Get your hands on the PUMA x ADER ERROR collection dropping globally on PUMA.com and select stores on 1st September 2018.